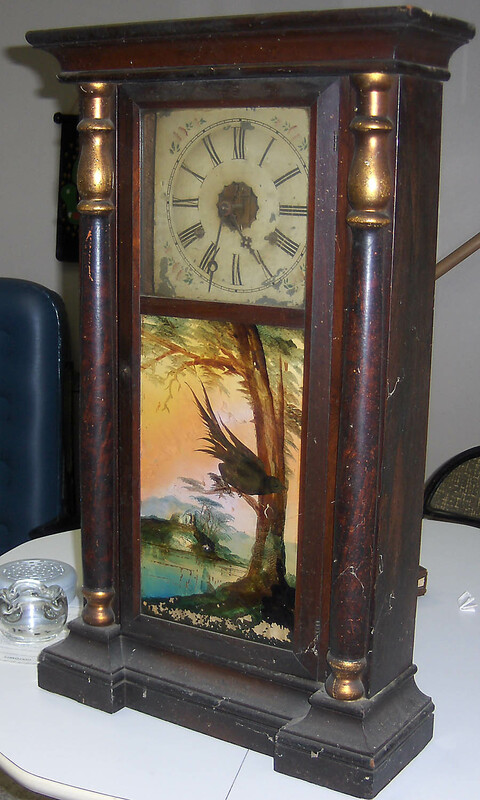 Peter Howell has this interesting heirloom clock made cir. 1864 in Connecticut by the S.C. Spring company. This photo below taken by J. Spencer Howell during his last visit in 2010. So the likely provenance of the clock is: William & Betsy (Cherry) Spencer -> Spencer & Maude (Campbell) Stone -> John E. & Elizabeth (Stone) Howell -> Peter & Lee (Johnson) Howell. This list shows the known “Immigrant grandparents” of Elizabeth Louise STONE Howell who came to North America. Clicking the name displays a tree showing the descendancy from the immigrant to Elizabeth Louise STONE Howell and her siblings. (this can be a large tree, so scroll your browser horizontally to center it, and vertically to see it) Clicking on a name in the tree displays details for the individual. Captain Samuel Cherry – New! Captain Samuel Cherry fought in the American Revolution. Tree to STONE here. Also found his portrait and a photo of his gravestone.